A new campaign called NYC Girls Project has hit New York City buses and subways. 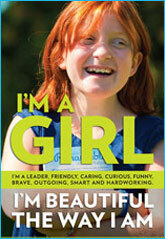 Intended for 7-12 year olds, the campaign hopes to tell girls they are beautiful the way they are. It is aimed at improving the self-esteem of young girls. The New York Times has reported that Samantha Levine – deputy press secretary of NYC’s mayor, Mr. Bloomberg – believes ‘Being a woman in this society , it’s sort of impossible to not be aware of the pressures there are around appearance, around weight, around trying to always look a certain way.’ With this thought, Ms. Levine, who is now serving as project director, approached Mr. Bloomberg with the campaign idea. In addition to the visually inspiring images found in this campaign, physical fitness classes, a program for addressing self-esteem and Twitter campaign #ImAGirl which invites girls to share what makes them beautiful the way there are, will be resonating amongst young girls throughout New York. Despite some initial criticism of the campaigns’ intention by The Daily Beast in the form of endorsing that ‘being beautiful’ is still the highest aspiration that a women should have, Lip believes this is a step in the positive-self-esteem direction. How do you think Australians can combat low self-esteem in young girls? Is a focus on ‘beauty’ in any form problematic? This entry was posted in News and tagged girls, in brief. Bookmark the permalink.